Hi everyone, I am feeling super under the weather today, but I wanted to make sure I published this post! 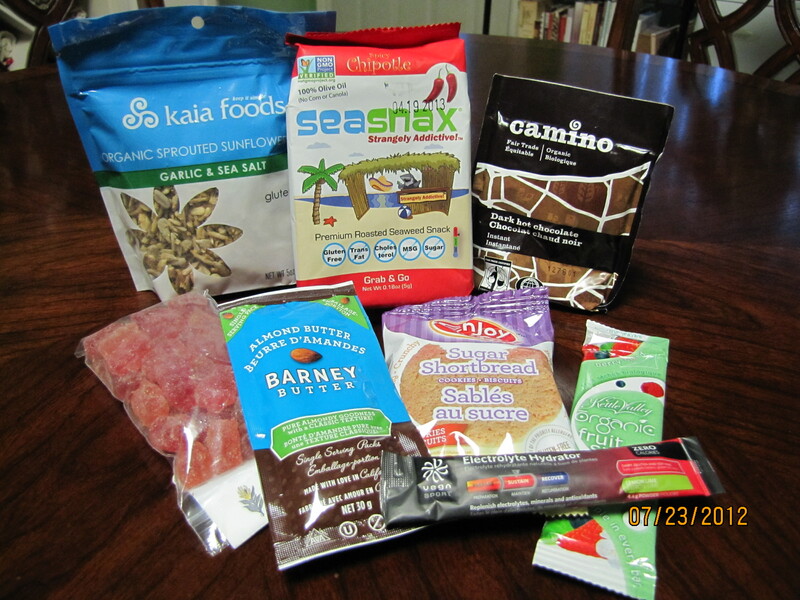 For July, I was pleased to participate in the foodie penpal program (see my original post here). My penpal- Francoise- asked if she could do a guest post regarding her goodies..check out all the cool stuff! First of all, I would like to thank Jen for letting me do this guest post on her blog. I received my box of goodies and was thrilled to open it. I was pleasantly surprised when I saw all the great stuff she had sent. Here’s a list of what I received as well as a few comments on each. 1. Organic sprouted sunflower seeds. This really made me smile…I have loved sunflower seeds since I was a child. I had never tasted them like this before (with garlic & sea salt) and wow….they were awesome ! 2. Dark hot chocolate. Well Jen did it again…another favorite of mine…hot chocolate. Nothing beats a great cup of hot chocolate and this one was great ! 3. Almond butter. I had never tasted this before. I really enjoyed its smooth texture and great taste on toast. 4. Organic fruit snack (berry blend). I’ve had fruit snacks before, but this one really packs a lot of taste. It’s made with real fruit and you can taste it in every bite. I’ll be carrying these around for sure! 5. Roasted Seaweed Snack. I haven’t tried this yet. It’s a health-conscious snack made with the finest ingredients. 6. Sugar shortbread cookies. I shared this one with my spouse. They are almost as good as homemade. We both enjoyed them a lot. 7. A package of sour candy. These practically disappeared as soon as they were out of the box. William (my spouse) says they’re delicious and thanks you very much Jen! 8. Electrolyte Hydrator (lemon lime). This replenishes electrolytes, minerals and antioxidants. It is something that I really need on days that I have chemotherapy. Jen couldn’t have chosen a better product! I’d also like to share with you all a quote Jen included in the hand written note she sent. ‘The only time to eat diet food is while you’re waiting for the steak to cook’ -Julia Child. You’ve just got to love this! A great big thank you to you Jen for making me discover some tasty new products. You’ve made my third participation one to remember ! It’s really good! Only problem I find is that is sometimes leaves a weird aftertaste.